Marc Schmidt bales a Christmas tree at the Ottman Fir Farm. The Ottman Fir Farm is located not far from the Greenwood Supper Club on County A between Gibraltar Road and County F. A small sign announces Christmas trees for sale. A meandering drive takes you to the place where you may cut your own trees and purchase wreathes, roping and boughs. The Christmas tree “addiction” or “disease” might be regarded as congenital. Herb Ottman, who owns the tree farm, began selling Christmas trees in Milwaukee in 1946, following the path of his father who had also sold them. Herb worked as a painting contractor, and because people don’t have rooms painted during the Christmas season, retailing trees was a good way to supplement his income. 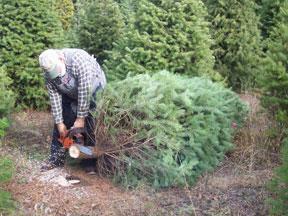 Ken Ottman cuts Christmas trees with a chainsaw on the Ottman Fir Farm. But while he retired from retailing trees in Milwaukee, he continued to be involved with the Ottman Fir Farm. Herb’s oldest son Ken, who is a retired forester, pointed out that the 12.5 acres of the tree farm have been in the family since 1913, originally part of a farm owned by his great-grandfather Otto Ohnesorge, who passed the land to Herman and Maude Ohnesorge in 1927. As Herb’s late wife Dorothy was their daughter, the land came to them in 1981. Ken remembers helping with the first planting of trees on the farm in 1964 when the Ohnesorges still owned it. He was about 15 at the time. And he has been a part of the enterprise ever since. Now the siblings, along with their sister Kristi who because of a disability can only be involved in a limited way, maintain the tree farm with the help of their children and an occasional cousin. A couple of toddler grandchildren are the beginning of the sixth generation on the land. Work on the tree farm becomes an adventure for the Ottmans as they are scattered from the Milwaukee to the Madison areas and must rent lodging for their stays in Door County. And the maintenance of Christmas trees necessitates a number of trips during the year, but the work occasions become reunions as family members pitch in to help. 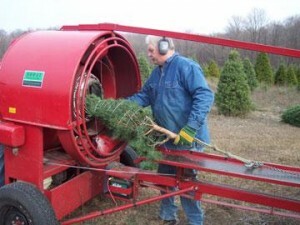 On a recent weekend Ken, Steve, and Leslie’s husband Marc Schmidt, along with a few of their children and cousins, were cutting and baling trees on the Ottman Fir Farm. Armed with chainsaws, the men cut 300 – 400 trees and put them through a baler that wraps each into a tight bundle with twine for transportation. Leslie said they preferred to use hemp twine as it is more eco friendly. Herb doesn’t like plastic twine or netting because it tangles. As both Ken and Steve have retail tree lots at home, the baled trees are destined for their sales. They also own tree farms in other parts of the state. Marc and Leslie Schmidt run the cut-your-own operation on the Ottman Fir Farm on weekends from Thanksgiving through Christmas, and will sell about 400 trees. The Fir Farm and the Christmas tree lots that the brothers maintain sell wreaths made by their wives Debbie and Susan (with the help of others) and decorated by Leslie, along with roping and boughs. However, much of the work required by the tree farm begins earlier. To ensure an ongoing crop, fir, spruce, and pine seedlings are planted in April; each tree that is cut or dies is replaced each year. The pines are sheared around the 4th of July, and the firs and spruce during the second week of September. The clipping not only shapes them, but increases their fullness. Also the trees are sprayed for disease and fungus control, once in June and again in July. Finally, pines are sprayed with a harmless green dye (a uniform practice in the industry) as they tend to yellow when they become dormant. His brother Steve laughed and nodded his head in agreement. While Herb still likes to be involved as much as he can, his deteriorating eyesight has limited his participation. But he likes telling stories to customers, Leslie said. “Mother had been involved from the get-go,” she added. The cut-your-own sales begin each year the weekend before Thanksgiving. The farm is open every weekend through Christmas, including both Thanksgiving Day as well as the day after. Saws are provided. The Ottman Fir Farm, located at 9248 Cty. A, is open for business on these days from 10 am until dark.